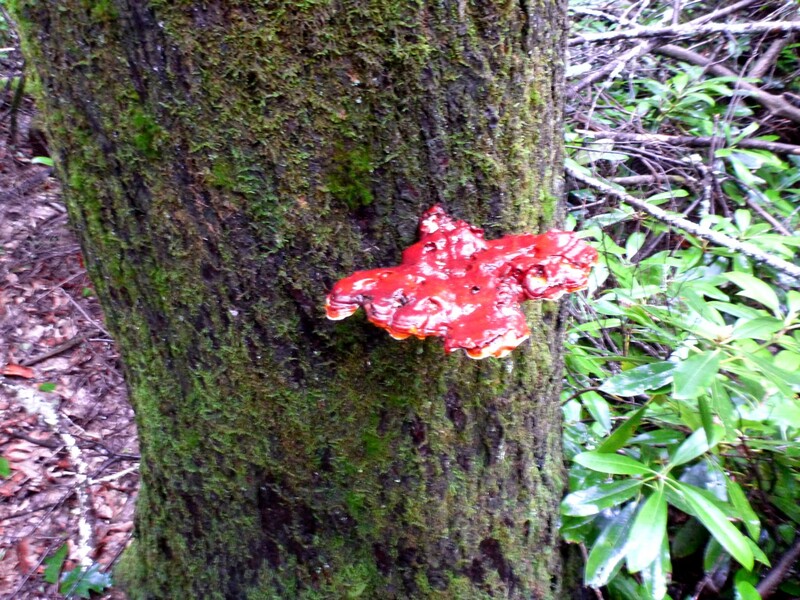 Posted by Jenny in Internet images, photography, public domain, publishing. I am going to put this message up maybe twice a year. It’s kind of a lost cause, and I don’t want to annoy my blog followers, so I’ll leave it up for a day or so and take it back down. 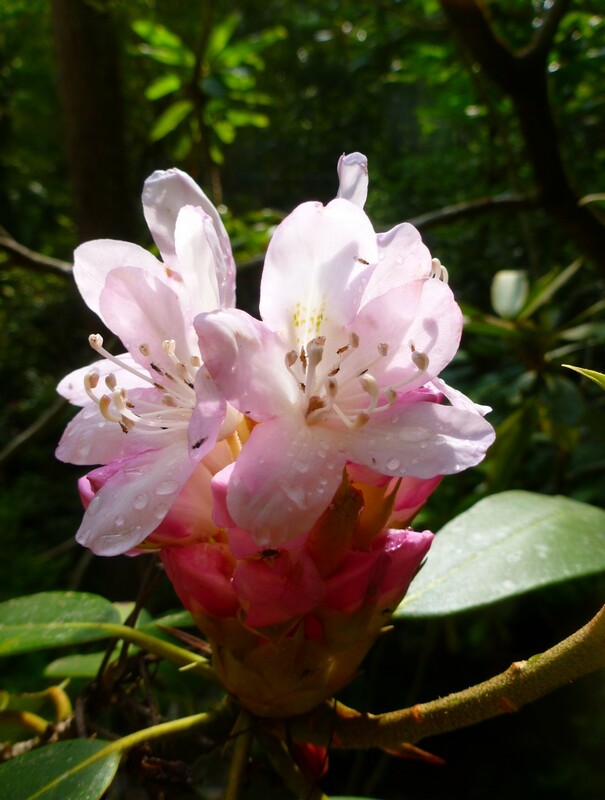 I’m not such a great photographer, so it amazes me when I see through my blog stats that someone is searching for something like “public domain rosebay rhododendron” and comes to my site. Sometimes people click on every single photo with a post I’ve done, and I know then that they are doing some sort of copying of my information. Public domain is complicated, but generally right now in the U.S. any image or text published after 1924 is not in the public domain. (I’m not quite that old, thank you.) Here’s the idea behind it: Someone who creates text or image deserves a certain amount of credit and unique use of it for quite a while. How would you feel if you drew a picture and then other people started immediately using it for their own purposes? I was sitting with her in a room with a group of people and I had to really restrain myself from getting angry. So, if I take my own photo and post it on the Internet, someone else can take it and use it on their own site without attribution? The Internet is complicated as far as sharing info is concerned. I don’t know what the story is with Facebook sharing of text or photos, because I decided a long time ago I was never going to get on Facebook (or other social media). All I know is, I pay very close attention to the OWNERSHIP of photos and text, and I do my best to respect it. I never use photos on this site other than my own, ones in public domain (mainly from Wikimedia Commons), and ones that I have specially obtained permission to use. No photos—it was raining when my friend Chris and I started, and what with my track record of taking fogged-up pictures, I decided to leave the camera behind. 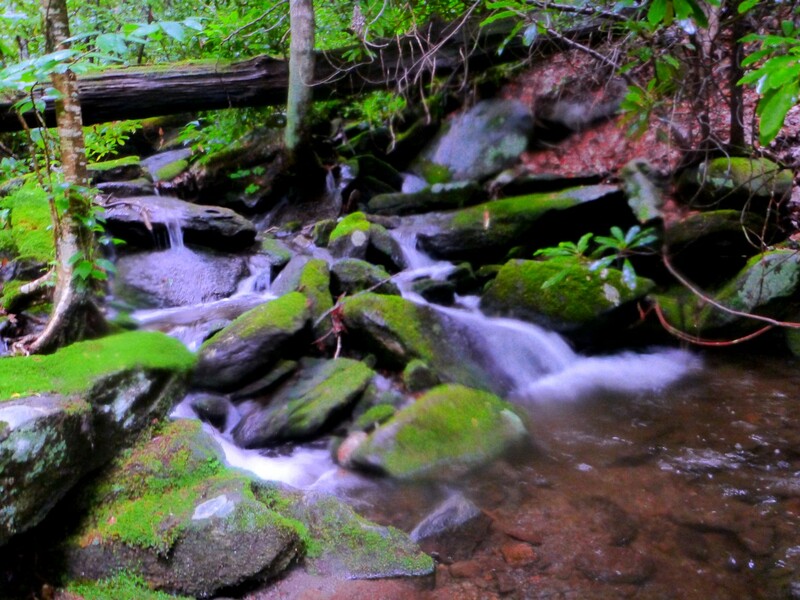 Anyone who’s read my novel The Twelve Streams of LeConte knows that Cole Creek is one of the twelve streams that drain the slopes of Mt. LeConte. I have climbed all of those streams, but I hadn’t climbed Cole Creek for a very long time and didn’t re-climb it for the book. I remembered it as a lot of work going through the rhodo without a lot of payoff. I’m going to revise that impression. The rhodo was even worse than I remembered, but the stream really does have some beautiful features. In particular, there is a whole series of lovely cascades flowing over sandstone bluffs. In one section of the stream, it is almost like giant stairsteps of stone with water gliding over them. Although the rain tapered off, all the rocks were slick—just about as slick as ice. This hike would be a lot easier in dry conditions, when you could just march up any low-angled block of sandstone. That was out of the question yesterday. And each time we reached one of these cascades, we had to figure out a way to go around to the sides. That involved fighting through ferocious rhodo. We got into trouble just below the junction of the left and right forks. To get around a good-sized waterfall, we headed into the brush to the right and climbed steeply. We figured we could go up a ways and then contour over to hit the right fork, which leads to West Point, a sub-summit of LeConte. Well, we should have stayed closer to the stream. Once we got above it, we couldn’t get back down to it. Why on earth not? Because the rhodo was up around 10 on the one-to-ten difficulty scale, and then we realized there were bluffs between us and the stream. We struggled, and fought, and wrestled the rhodo, and we were going practically nowhere. We finally decided to follow the path of least resistance up to the ridge that’s the divide between Cole Creek and Bear Pen Hollow. We made it up there and looked at the map. We were at about 4700′. It was a long, long way to get to West Point! And the ridgecrest had greenbriers as well as rhodo. We decided to cut our losses, drop down to Bear Pen, head downstream, and call it a day. We made decent progress—as in, we weren’t crawling the whole time—and finally spotted a gully that led to Bear Pen. The last 20 yards to the gully took about 15 minutes. It was a strange combination of rhodo and blackberry over blowdowns with deep holes underneath. I found this the hardest stretch of the whole trip. We worked our way down the gully and after a while finally caught a break. We found open woods to the right and were able to walk comfortably through them. We popped out on the Newfound Gap Road between the Bear Pen and Cole bridges—absolutely filthy and wet. It had taken us six and a half hours to go about a mile and a half. We’ll go back, and next time stay closer to the stream. 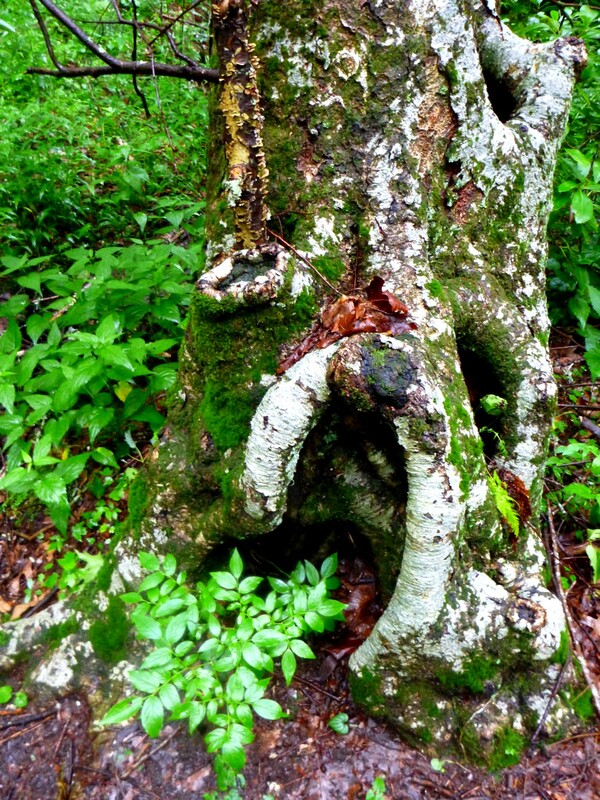 Posted by Jenny in conservation, hiking, Southern Appalachians. I revisited Joyce Kilmer/Slickrock Wilderness this weekend and realized that I need to come here more often. It is a very beautiful place. My friend Gary was visiting from out of town, and he came up with the idea. I don’t have an up-to-date guidebook or map for the area, but we decided to wing it. The only information I have is in the old Sierra Club “Blue Book” guide to the Smokies and surrounding areas, published 1973. Things have changed just a bit since then: for instance, the Naked Ground trail was called the Little Santeetlah Creek trail. There’s a Naked Ground trail in the book, but it was a short ridgetop route. The Blue Book still has one big thing to offer: it is really good on historical background of the areas (and incidentally contains a lot of great info about trails no longer maintained). In the world of conservation, there have been two big changes since the Sierra Club published the book. 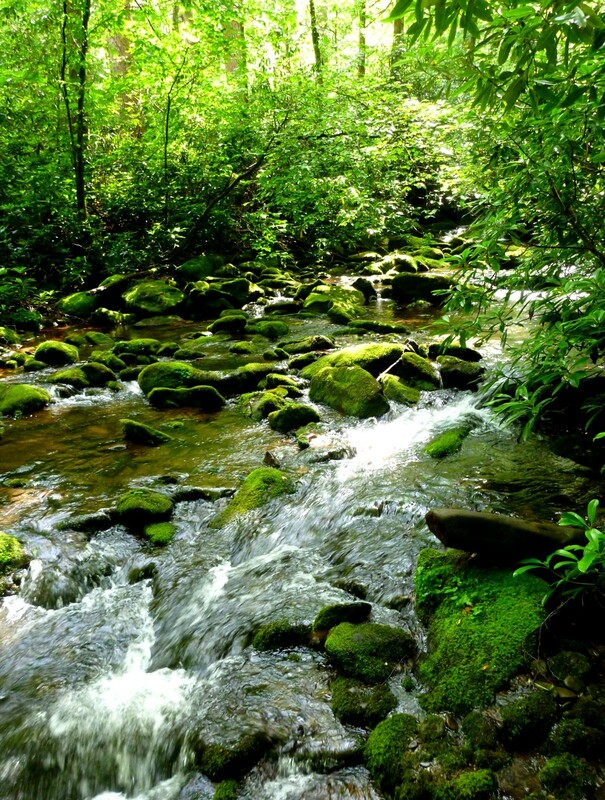 In 1975 Congress designated the basins of Little Santeetlah and Slickrock as the Kilmer/Slickrock Wilderness. 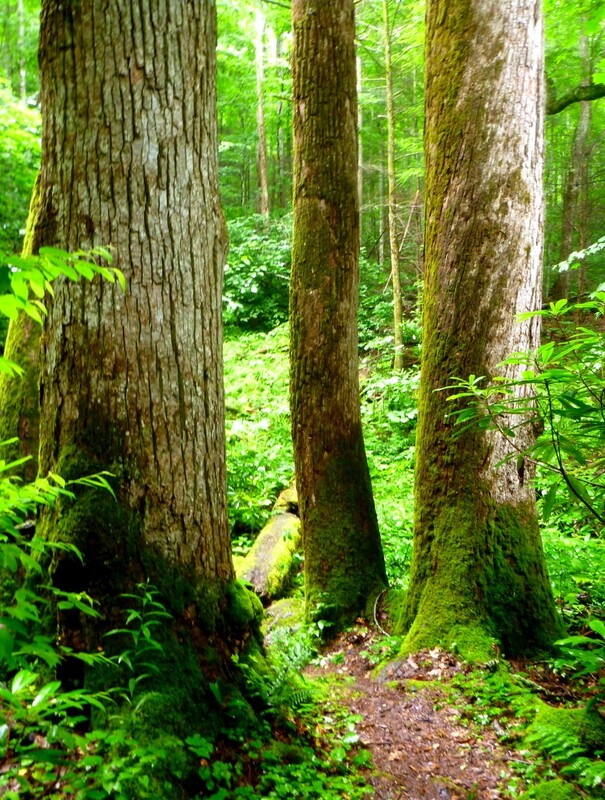 The Little Santeetlah basin had been protected since 1936 with the creation of the Joyce Kilmer Memorial Forest, but the Forest Service was still advertising for bids from logging companies in the Slickrock basin through the late 1960s. Before 1936, most of the Little Santeetlah basin was spared logging only because the Belton Lumber Co. went bankrupt in 1890. The other change is the Cherohala Skyway. 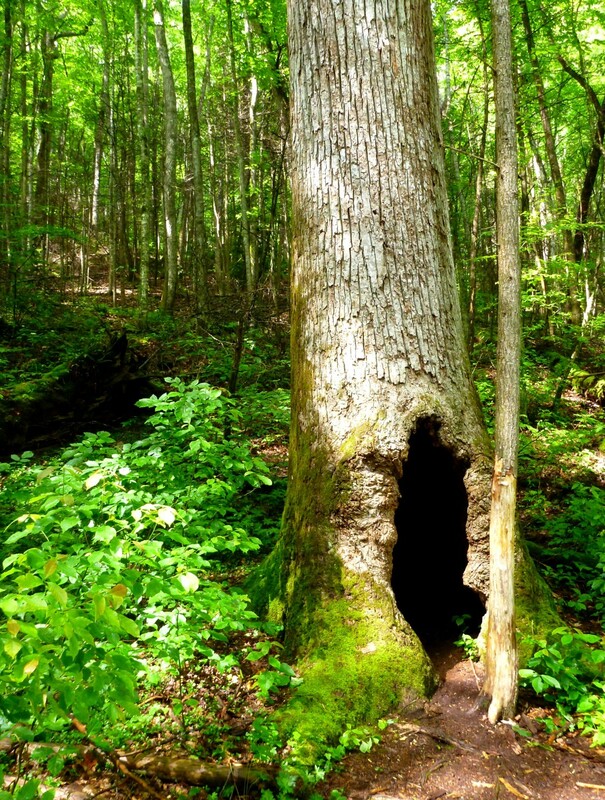 The Blue Book talks about a proposed scenic highway connecting Robbinsville NC with Tellico Plains TN, and it urges people to write to the Forest Service opposing it. That battle was lost, and the Skyway was completed 1996. It has become super popular with bikers, who use it to connect with the “Tail of the Dragon” on US 129 along the southern boundary of the Smokies. Well, the consolation is that you leave the biker noise behind pretty quickly when you exit the Skyway and get into those big old-growth woods. 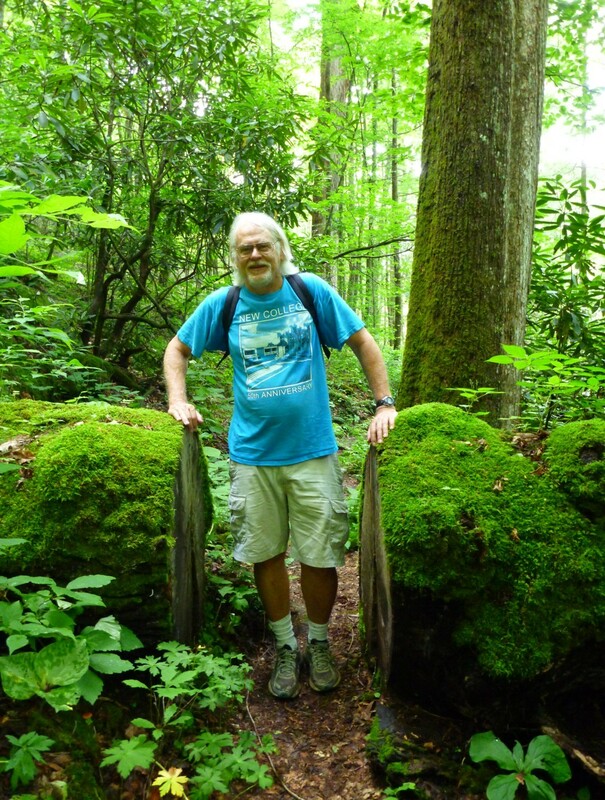 So Gary and I drove to the Joyce Kilmer picnic area and went around the loop trail, a little vague as to trailheads to get up into the basin. When we came to a sign that said “Naked Ground Trail,” we looked it up in the book, found the outdated writeup, and decided to follow the trail anyway. We figured it would take us up along the stream, and it did. The trail leads through a beautiful forest of big trees carpeted with partridgeberry, ferns, moss, dwarf iris, and many other plants of all descriptions. You start at 2,200′ in the parking lot and reach 4,845′. The climb is gradual for the first three miles or so, steepening considerably toward the top. Naked Ground is a saddle in the horseshoe-shaped ridge that surrounds the basin—apparently it used to be bare, but it’s wooded now, with just one viewpoint down into the valley. We had lunch at Naked Ground and chatted with a nice pair of backpackers who had driven from Atlanta that morning. A big thunderstorm was coming in. As the weather soured, we opted to go back the way we’d come. The rain pelted down as we descended the steep upper switchbacks. Gary was wearing running shoes and found himself slipping and sliding. The shower let up after a half hour, and we enjoyed the moist woods, where all the trees looked refreshed by the rain. The sun emerged as we reached the lower section of the trail, and it was the best of both worlds: shining light hitting the moistened leaves and blossoms of the forest. The Wilderness Society is now working to expand protection for this valuable area.